Lynn and Bob Tompkins are my bird heroes. Without them this barn owl would have met its demise long ago. We live in the land of wind turbines, long stretches of highways and hunters and agriculture. Lead poisoning, impact wounds, and destruction of nesting sites would fill a blotter sheet of crimes. All of these hazards in some way contribute to the injury or surmise of raptors. Fortunately we have bird heroes. Lynn and Bob Tompkins are the founders of an amazing rehabilitation facility, Blue Mountain Wildlife, located south of Pendleton. The pens, a tiny intake vet clinic, temporary housing for interns and their home sit on a windy hilltop. 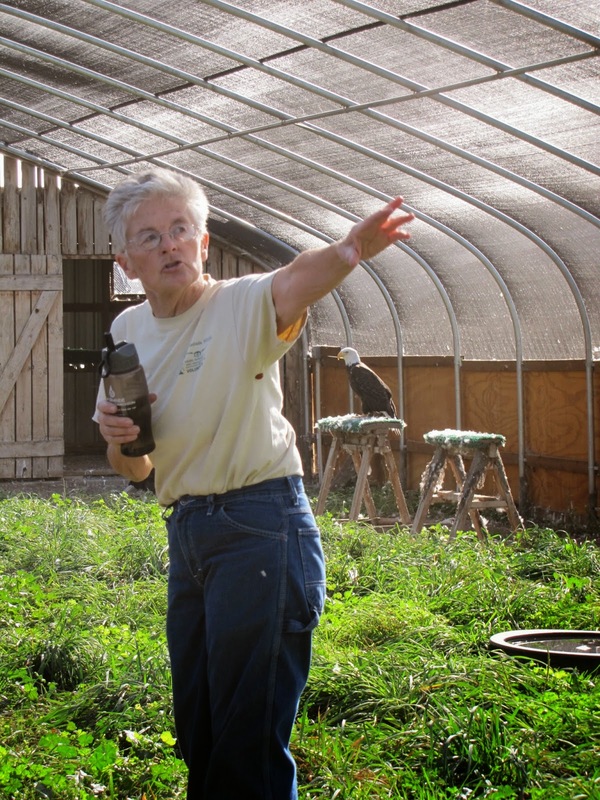 Their facility is the emergency bird ward, nursery, and rehabilitation center for a fifty-thousand square mile area. With one of the highest release rates in the country, Lynn and Bob with the assistance of one part-time employee, summer interns, many vets, Umatilla Reservation Bus Drivers and volunteers keep this haven for birds operating for the benefit of all of us. 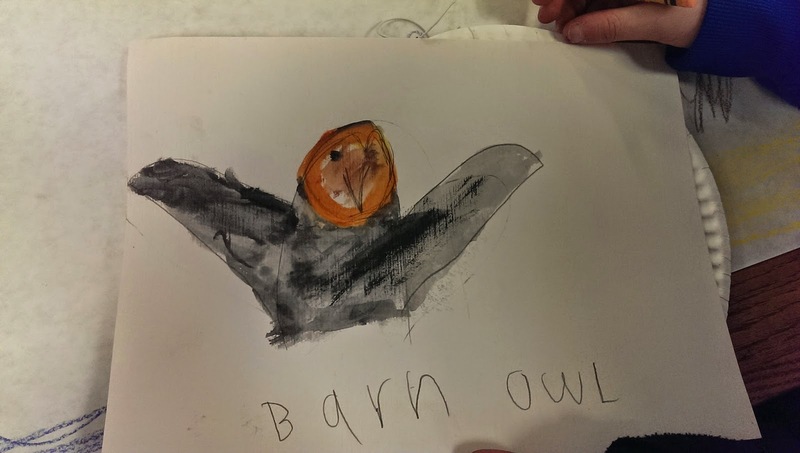 Barn Owl by Sam, age 9. "All of us" includes for the benefit of children. 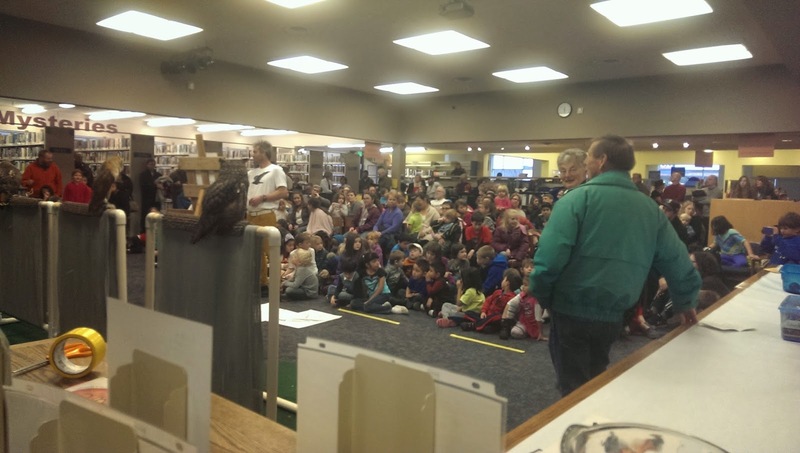 As if running the refuge isn't enough work, Lynn and Bob routinely take a few of their birds (those who cannot be released to the wild) to schools and events. They are training the next generation of bird heroes. 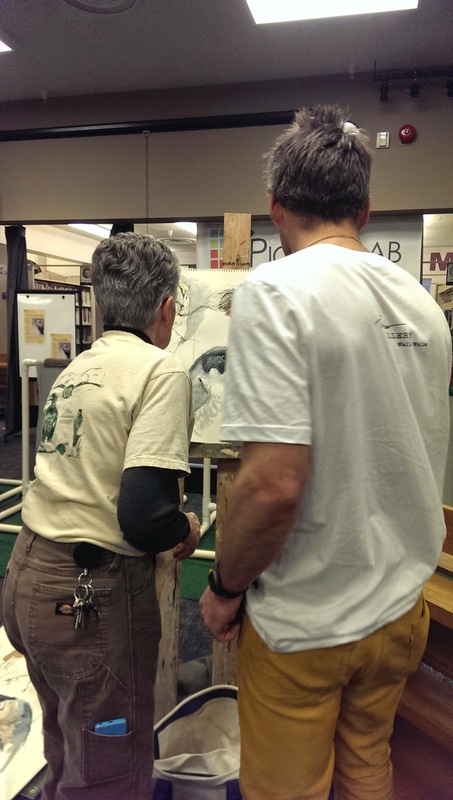 Todd Telander (white shirt in the middle) draws from live bird models at the Walla Walla Library. 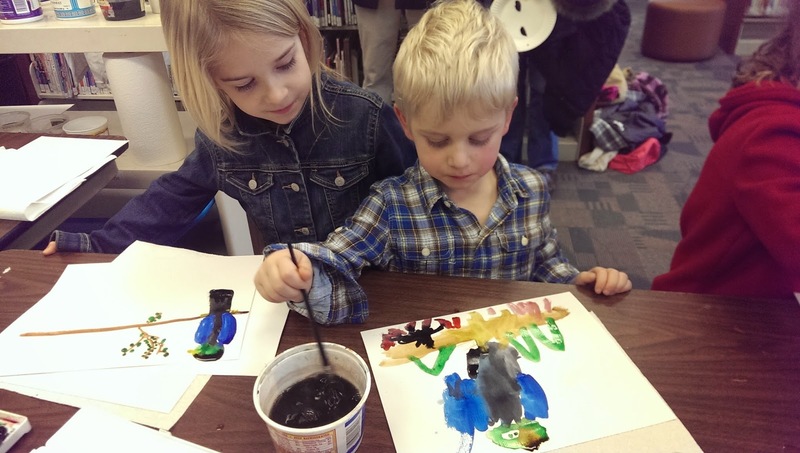 Teaming up with Carnegie Picture Lab, the Walla Walla Public Library and Audubon Lynn and Bob have set into motion opportunities for children to learn about birds through drawing. The kick-off event was at the library which is to be followed by nine school events. The local artist, Todd Telander, illustrator of a number of reference books drew and painted from four live models. He did five drawings in the first half hour! While children headed off to draw birds from photos, Todd just continued drawing away to the delight of everyone milling about. Or just go to the site, read Lynn's journal. The tales are as good as any Batman storyline. 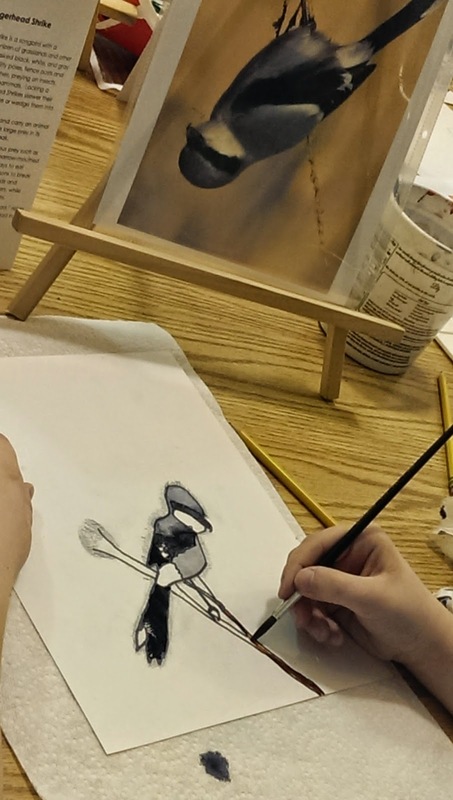 In the meantime, Carnegie Picture Lab with its fabulous volunteers are bringing art to the valley. 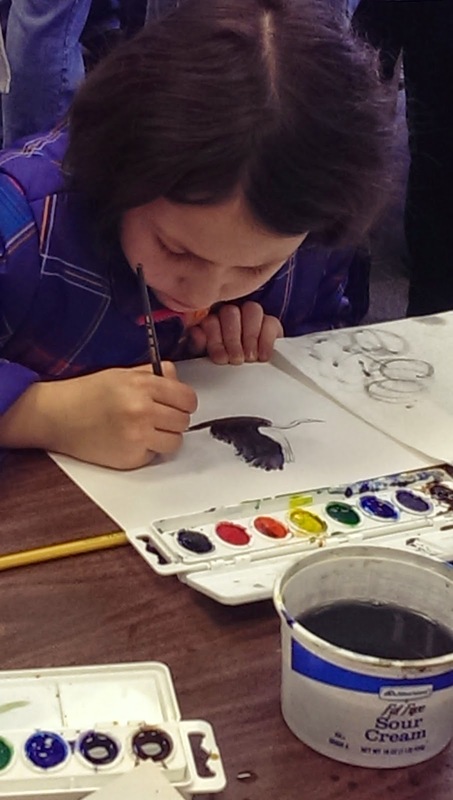 Photos mostly by local Audubon member, George Jamison and one of our UB photographers are the inspiration for children and their parents drawing birds and learning about their unique habits. On a typical day I might spot a few chickadees, sparrows, and juncos at my feeder. A hawk will fly by checking the activity, a few magpies, crows swing through and Canadians fly overhead. Ducks swim the creek and I can usually hear some mourning doves. But a Walla Walla birding list is much more diverse than that. On the Christmas Bird Count Day this year 10,678 birds of 87 species were totaled. They were counted by forty well-bundled Audubon members on one cold and very foggy day. The count centered on an eight-mile radius of Bennington Lake. We actually have over 200 species in the countywide area. Introduce birds to children now and they may become the bird heroes of the next generation of bird vets, artists or refuge managers. 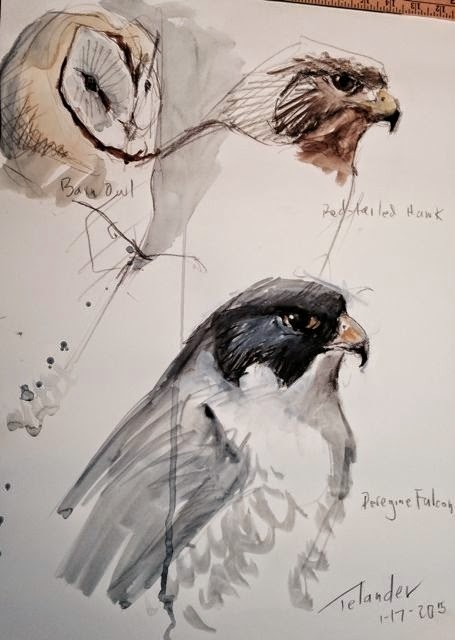 Are you thinking of drawing birds? Turn a photo up-side-down and the results are surprising. Your eyes focus on the shapes, not your preconceived idea of bird body. Try it! Loggerhead Shrike. Photo by George Jamison. Art by a child.